A coworker of mine is pregnant. And a vegetarian. And when her doctor suspected she might have gestational diabetes, she had to cut back on the bread and pasta, which didn’t leave much for her to eat except vegetables. I mentioned the asparagus and shrimp salad I’d made before, and told her you could easily leave out the shrimp and it would be mostly asparagus and chick peas. She loves chick peas, but doesn’t like asparagus. So I told her I’d make some and bring it for lunch. She tried it. Now she likes asparagus, too. Drain and rinse a can of garbanzo beans. You can soak your own dry beans if you want. Prep 1-2 pounds of fresh — not canned — asparagus. Fresh-cut asparagus, you can just go ahead and start cooking. But if you buy it at the store the cut end will have started to dry out. You don’t want to eat that. By hand, snap off the dry bit and throw it out. You’ll feel that it’s tough and woody compared to the rest of the stalk. Then cut the rest of the stalk into bite-sized pieces. Blanch the asparagus. What, you’ve never blanched? Bring a large pot of water to a boil. Prepare a large bowl full of ice water and set it aside. Working in small batches, boil the asparagus until just softened. Scoop the finished batch out with a slotted spoon and transfer to the ice water to stop the cooking process before the asparagus becomes mushy. 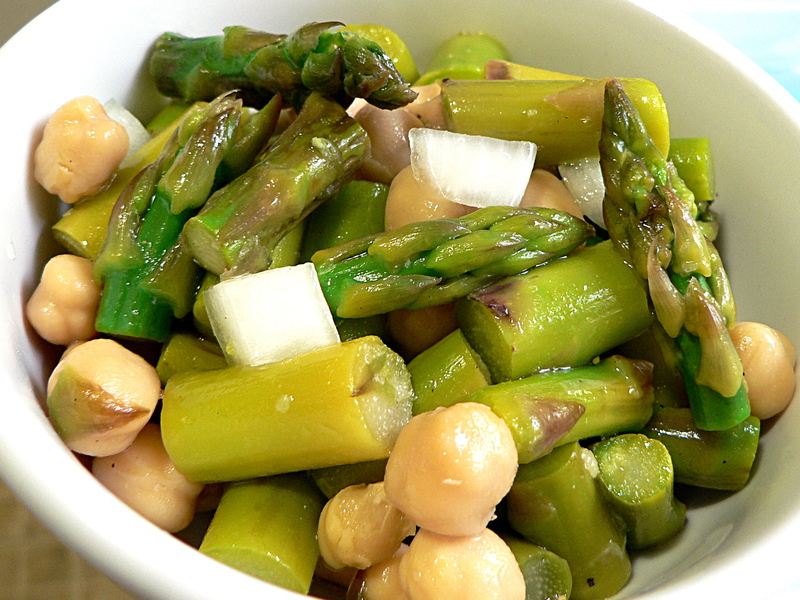 When all the asparagus is done, drain it and combine with the chick peas. Dice a quarter of a red onion and add that. (Yes, that’s white onion in the picture. I thought I had a red one, but I didn’t.) Add a couple of tablespoons each of olive oil and white wine vinegar. Season with salt and pepper and toss. Willpower will help you for a while but for 95% of the people who lose weight dieting, they will eventually gain it all back and then some.